The latest trend in tattoos is the white ink tattoo. In the past, tattoo artists sparingly use white ink. They simply use this to highlight bits and parts of the design. The so-called white ink tattoos only use white ink to complete the design. Because of its uniqueness, it is now gaining a lot of attention. One quality that is distinctive about white ink is that it is low key. Unlike black and coloured tats, this is not very visible. The faint lines merely resemble an intricate scar and can represent femininity. This is why this type of tattoo is popular among women. People involved in professions who frown upon tattoos may also opt to get white ink tattoos. In contrast to traditional tats, these pale designs are not really noticeable. One problem that you may encounter is finding a tattoo artist that would do the design. Because of the relative difficulty of this type of tattoo, only a handful of professionals perform these. Sometimes, even seasoned tattoo artists hesitate to do these designs because of the complexity of the process. There is always a risk of tainting the white ink and ending up with a messed up tat. For instance, in the traditional way of tattooing, a stencil is done before the process. However, the dark stencil ink may mix with the white ink, and then leave you with a grey tint instead of pure white. In another tattooing technique called the bloodline, a needle is used to draw blood along the outline to mark the design. However, this also has the probability to mix with the white ink and may turn out pinkish in the end. Therefore, the freestyle method of tattooing is probably the safest way to do it. This means it is up to the artist to do the design without any visible guide. Of course, the downside is that it is very difficult to see where the pigment is injected. Another potential problem is that the white ink can cause a skin reaction, seen more commonly than coloured inks. The ink may also heal pale yellow in some people. On the other hand, the ink may heal transparent and may not be visible at all. 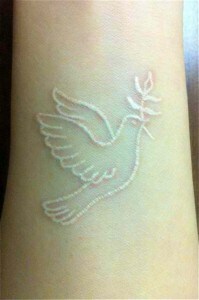 In some, it can look embossed or brand-like if the tattoo scars raise during the healing process. This happens when the tattoo artist overworks your skin with the needle since the white pigment is hard to see. In darker skinned individuals, the white pigment may not be absorbed adequately. White ink is best for light coloured skin and on areas of the body that are not frequently exposed to sunlight. White ink tattoos are also more likely to fade compared to other ink pigments. How it appears on your skin depends also on the quality of the ink brand. Popular designs are simple ones such as flowers, hearts, small celtic patterns, and words or phrases written in cursive or fine script. In getting white ink tattoos, it is recommended to get a design that is simple rather than something that needs a lot of filling in.